Facebook: Latest Edition of the most Powerful Media Player TV Box in its class! Item 872: $48.95Can or $36.52us Brand New. 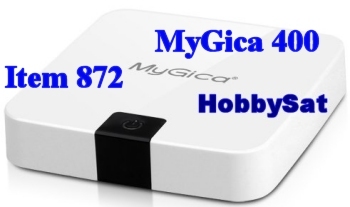 The Most Powerful Media Player/Internet Streaming TV box in its class, Brand New MyGica ATV 400 Latest Edition. 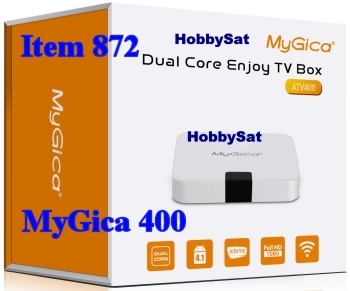 Make way for the thinnest and slimmest Dual Core MyGica ATV400 Android TV Box available. and free apps as you want. experience. 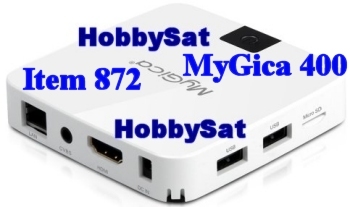 You can now use internet TV, Internet Radio and surfing on the Internet anywhere. news, chat with friends and many more. It is a revolutionary new way of entertainment on your TV. ATV 400 and share it with all your Android devices or vice versa. Video: mpeg-1, Mpeg2, MPEG-4, H.264, VC-1 1080P, WMV, MOV etc. •	TV with HDMI in or RCA A/V inputs. •	WiFi Router with preferrably N support at least G support. •	Authorized MyGica Dealers offer 1 year warranty Either by Repair or Exchange. • Exchanges are only done if the unit cannot be repaired.